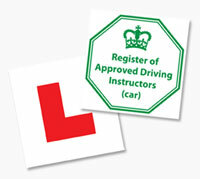 The Ideas4ADIs range of roof signs, decals and accessories are produced to the same high standards to enhance the professional image of the instructor/driving school. Made from high grade UV treated acrylic our roof signs all carry a minimum 3 year ‘stay white’ guarantee*. Our Magnetic Panels are made from ‘vehicle grade’ magnetic sheets. Graphic lettering is applied using 5-7 year life vinyl and is available in a range of fonts and colours. The ALCOSENSE Breathalyser is an essential piece of kit to keep you and all road users safe from the 'morning after' effect of alcohol. This style roof sign has a distinctive shape and a central raised L to make you stand out from the competition. Our roof signs are made to the highest standard utilising top quality components and materials. They are made from 5mm Acrylic Capped ABS which have been UV treated to prevent fading from the sun, resulting in them lasting much longer than the average plastic roof sign. In fact, they are guaranteed to stay white for a minimum of 3 years*. 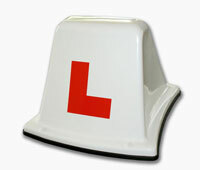 All roof boxes are supplied with red L’s. This traditional shaped roof sign has the L on one end, allowing more space for graphic text, making your school name and number more noticeable. Our roof signs are made to the highest standard utilising top quality components and materials. They are made from 5mm Acrylic Capped ABS which have been UV treated to prevent fading from the sun, resulting in them lasting much longer than the average plastic roof sign. In fact, they are guaranteed to stay white for a minimum of 3 years*. 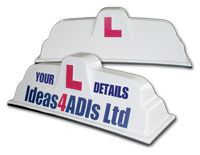 The NEW Aero D sign has been added to the Ideas4ADIs roof sign range for those ‘GREEN’ ADIs who like to get a bit more mileage out of their fuel tank. Its aerodynamic shape has been proven to save up to 10% on fuel consumption†. The Aero D is the ideal solution for those ADIs with the new compact car shape: new shape Vauxhall Corsa, Ford KA, BMW Mini, Nissan Micra,VW BEETLE, Fiat 500,Mazda 2 and similar compact cars with greater roof curvature. †Tests conducted on behalf of PMN Ltd 2006. This compact top hat roof sign is quick easy to install. Made to the highest standard utilising top quality components and materials. These signs are made from 5mm Acrylic Capped ABS which has been UV treated to prevent fading from the sun. Produced using high quality White Gloss ‘Vehicle Grade’ magnetic sheet our magnetic side panels are the ideal solution for schools who don’t want permanent signage on their vehicles. Graphics are applied to the panels using 5-7 year life vinyl and are available in a variety of colours and fonts. L Plates & ADI Badges. 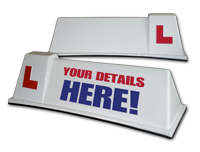 All our plates are produced to regulation L Plate size (178mm x 178mm) and printed on to high quality gloss vehicle grade magnetic sheet. How many times has a pupil got into your car for a lesson and you suspect they may be suffering from the 'morning after' effects of alcohol? Did you know that if you are supervising a driver under the influence of alcohol you could lose your ADI licence? That's as well as a fine, disqualification or points on your driving licence and increased insurance premiums. 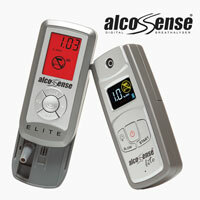 Safeguard yourself, your livelihood and other road users by having an AlcoSense breathalyser at hand. Pack of 20 spare blow tubes for use with AlcoSense breathalysers. Every time you use a AlcoSense breathalyser you should use a new blow tube to ensure hygenic use and extend the life of the unit. Blow tubes help to reduce the amount of moisture in your breath reaching the alcohol sensor inside the system. We are constantly updating our product range - why not sign up to our newsletter and we will let you know about any new developments.